If I didn't know better, I'd think it was spring. 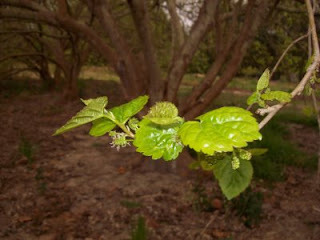 Young mulberry leaves are starting to unfurl and the tips of the maple tree are swelling with promise. A Carolina wren keeps sneaking into our garage in search of potential nesting sites, while a hormonally charged cardinal pecks repeatedly at the kitchen window. Even the emerging weeds are reacting to the weather as if it were March instead of the end of January. Wild geranium, Spanish needle, and sow thistle are among the more identifiable weeds growing with abandon wherever an irrigation spigot has dampened the ground. Even two of the more robust varieties of clumping bamboo, which normally wait until all chances of frost are past to demonstrate above-ground growth, are tentatively sending out tender new shoots. Is it winter or spring? The calendar says one thing, but nature says another. One of the marvels of life in the Sunshine State is the swift succession of changing seasons. You can wake up in the morning reluctant to abandon your cozy bed because the temperature outside is in the 40s and the house is chilly. A few hours later, you're unbuttoning sweaters, rolling up sleeves or discarding outerwear entirely because the air has gotten so warm. Blink and it's winter. Blink again and it's spring. Lately, as I watch the plants respond to January temperatures in the mid- to high-70s, I feel awed by nature's adaptability. What happens when the inevitable cold snap -- (it will be unseasonably chilly this week, for example) -- nips at the tips of those unfurling mulberry leaves? Will they wilt and fall off or maintain their momentum, hang on and endure? During my early years as a Florida resident, I would get upset when chilly weather killed back the tropical plants in my yard. My mood would take a dive when green leaves turned black, flowers shriveled up and ripening fruit either fell off or withered on the stem. I'd feel and look as glum as the landscape. While I still prefer warm weather to cold and would rather we didn't have to endure the ugly aftermath of a freeze, I now realize that a bit of chill is not worth getting worked up over. Plants rebound with remarkable efficiency, often responding to temperature dips with unexpected vigor. The few plants that don't make it probably deserved more care than I could provide and didn't belong in my yard in the first place. I'm learning to appreciate whatever nature dishes out. If it's an early crop of mulberries because the weather has been so warm -- wonderful! If there's no crop at all because a freeze zaps the young fruit, well, we'll make do without. Even the blackened leaves of cold-sensitive plants aren't so awful if viewed with perspective. Dead leaves fall off and, when left on the ground, decompose into soil adding important nutrients to be absorbed back into the plant. The end result: Larger, healthier plants as the seasons progress. Although the calendar hanging on my office wall still says January, it looks and feels more like March. With the exception of the window-pecking cardinal who has confused the unseasonable warmth for territorial protection time, I'm enjoying these premature peeks into the real spring ahead. Warm days, emerging fruit, new shoots, green leaves and a crazy red bird repeatedly attacking the window . . . if that's not enough to put a bit of spring in my step, I wonder what will?